Online Directories, Professional and Social networking sites are rich sources of high-quality business leads. LeadGrabber extracts contact information from these websites in a single click. It grabs the name, job title, email address, company, phone, etc. and stores in a spreadsheet format. Contacts found online typically lack business email addresses and phone numbers. LeadGrabber appends missing email ids and phone numbers for you, so you can start prospecting immediately! The software finds this data using real-time searches on the Internet. LeadGrabber directly transfers prospect lists to Salesforce.com, PCRecruiter (PCR), ACT!, Excel and Outlook. Tool finds corporate email-IDs of all prospects & does an instant server ping verify to come up with a spam-safe index. The index enables cold emailers to avoid being blocked by ISPs & labelled as spammer. Live social media search filters enables you to find recently promoted & hired decision makers, not available through list builders whose list are 6+months old. I have been using LeadGrabber Pro for two years, and I just renewed for a third year. Walk-away functionality: just click on the "Grab" button, and a list is automatically built for you. LeadGrabber Pro allows us to source thousands of new qualified prospects each week. It's more cost-effective than purchasing lists and the quality is much more accurate. LeadGrabber Pro very very good. It enables me to supply my customers accurately and cost-effectively. Great Product... allows me to tell my sales team to change directions each day or week depending on what we have going on in the office. Build 100's of new B2B sales leads everyday from the Internet! Anyone who needs a Lead Generation Software to speed up prospect-list-building by 5x-10x. Try 50 Capture-List & Append-Emails for free. The trial is intended for you to verify our tool is at least 3x (300%) faster & more accurate than your best researcher! We recommend you give same 50 contacts to both eGrabber & your researcher. eGrabber will be done in 45 minutes; your researcher is likely to take most of the day! Annual$3,495 per year Most Popular! Access to all functionality will stop when license expires. Must renew license to continue access. 1. Our technology architecture results in lower operating costs. LeadGrabber Pro runs on your personal computer, and NOT on our servers. We don’t have to undergo maintaining a huge web-server infrastructure, like other competitors, to support you. Our solution uses your personal computer and your internet resources to do the research – saving us costs that we pass on to you. 2. We have lower R&D overhead, resulting in cost savings to customers. By having a large part of R&D done offshore, our costs are small fraction of what other companies incur. Our high ROI Sales tools have enabled 100,000+ US Companies over the past 20+ years to be more productive. We have already amortized our cost of R&D over many years. 3. We have lower marketing costs, resulting in lower cost overhead. We don’t tend to have priced marketing executives flying to expensive tradeshows to seek visibility. We don’t have to recover those expenses by charging our customers. This strategy has enabled us to deliver lower priced high quality solutions, helping us organically to accumulate 100K+ companies as paid customers. 4. We have lower sales costs, resulting in lower prices. We don’t seek Enterprise Customers; Our typical customer has a 1 to 10 sales team; is an entrepreneur, owner or department manager who is very ROI focused in cash allocation. They can determine within hours our products are accurate, provide great ROI, within their budget – resulting in pretty short purchase cycle. They see we provide solid features, without all the marketing fluff that doesn’t help them sell more. Regarding Accuracy - What is the success rate in Finding Valid Work eMail ID? eGrabber researches deep web and finds email-ID faster & better than human experts. eGrabber tool finds 99% of the emails that expert researchers find & is 10x faster than a human researcher. researches 50+ leads per hour Unlike most human researchers, it will go back ping the company’s email server to verify if the found email is still valid. Sometimes a LinkedIn profile might say a person is working in a company, but in reality they are gone & company disconnected their email. This method catches that. If you use #2 rated emails, then deliverability will be around 75% - because in such emails, the company’s email server refuse to acknowledge existence or not existence of such an email. To find out what the accuracy rate for your industry and title is, we suggest using our free 50 contact trial. Get yourself 50 contacts that represent your ideal sample & do a live test. That is the best way for you to know what type of accuracy you can expect. Why is Building Lists with LeadGrabber better than Buying Lists? Tool finds corporate email IDs of all prospects and does an instant email Verify & history check of spam complaints by the company, to come up with a spam-safe index. The index enables cold emailers to optimize not being blacklisted by ISPs or not labelled as spammer. ISP’s get suspicious of marketers who have high bounce rate, so it is always best to use spam-safe emails. Cold email accounts sending to personal accounts like gmail get easily blacklisted, because google knows you are delivering same email to multiple gmail accounts. You are better off sending cold email to work email IDs. $3,495 Annual License includes 35,000 leads with full verification status – includes training & phone support. No List Buyer provides targeted lists for such prices. We have been in the business for 20+ years and we have the deepest technology & volumes to provide such pricing. Why is eGrabber better than Competition? We do "deep web Search" for each prospect's web foot print – competitors "just Google"
We have option to avoid duplicates - from previous days or weeks! 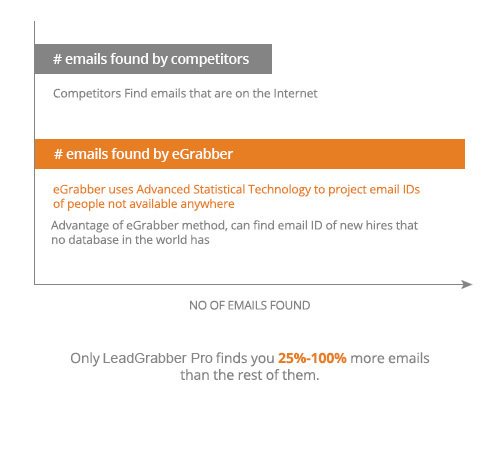 How LeadGrabber Pro finds eMail-Addresses better than anyone else! You can extend the functionality of LeadGrabber Pro by purchasing optional add-ons. Free monthly re-training webinars available so that you can keep newbies trained and discover new ways to use the tool. Training schedule is here. *** Email support@egrabber.com or Call us at 1-866-299-7314 for getting Plug-in for Free. Intel i3 or above is recommended. 4 GB RAM or as required by the OS, 20 GB free disk space to install / run the application. You can use eGrabber products on Mac using AWS or Parallels.